The tentative agreements are subject to a vote by each union's rank-and-file membership. Levin said his union would be voting on it tomorrow. The city council has scheduled a special budget session tomorrow night. Local 21's tentative agreement calls for an extension of the twelve unpaid furlough days that city workers have taken in the past few years, plus another eight "floating" unpaid days that would be used at each employee's discretion and thus would not force the city to close for business. Local 21 also agreed to forgo merit raises for the next two years. The Oakland police union, meanwhile, has finally agreed to pay 9 percent of its pension plan, a concession that the union refused to make last year and resulted in the lay off of eighty cops. Firefighters have agreed to 9 percent compensation cuts. The firefighters' union told the Chronicle late last week that its concessions would save the city about $9.5 million a year. The only major city union that has not reached a tentative agreement yet is SEIU Local 1021. If that union strikes a deal with the city as well, then the total savings from the five union deals would be about $40 million for all of the city's various funds. "Hopefully, they're close," Levin said, referring to 1021. 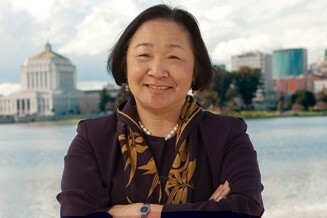 Update 3:15 p.m.: Mayor Quan said that the city has reached a tentative agreement with SEIU Local 1021 as well. "All that is left is clean-up language," she said. As for the tentative deals, she said, "We've been moving steadily with all of the unions for a while now, and all of them are in various stages of ratification and clean-up language. I'm very optimistic."